A brief history Kelley Engineering and an introduction to our current crew. Kelley Engineering was started in 1972 by Walt Kelley in Brookston, Indiana. Brookston is located about 10 miles north of West Lafayette, Indiana at the intersection of SR 18 and SR 43. In 2000, Walt and Kevin (Walt's son) partnered to form Kelley Engineering, LLC. Walt Kelley, the founder, is a graduate of Purdue University in Agricultural Engineering. 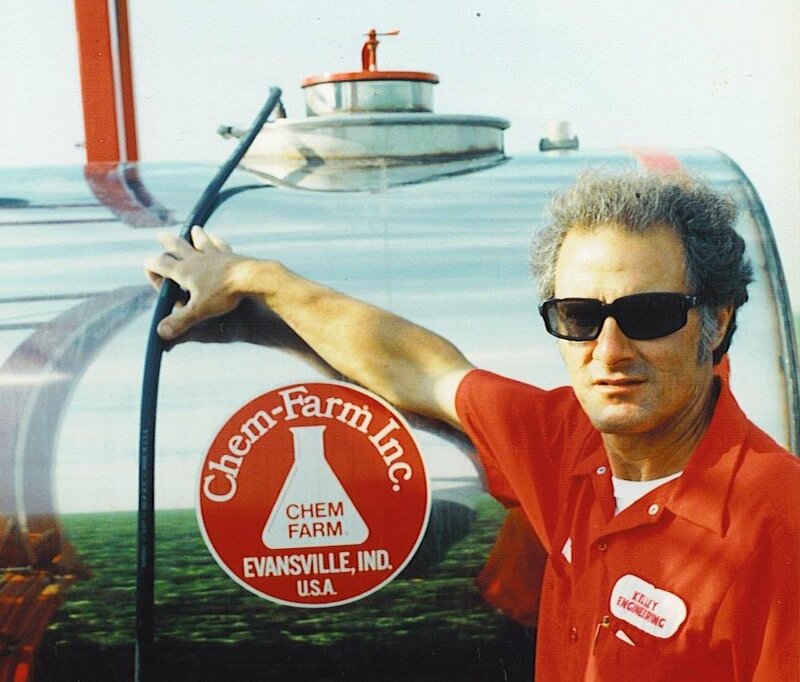 He started Kelley Engineering in 1971 and the first product line he represented was Chem-Farm® tanks, sprayers, and incorporation kits. Kevin Kelley, also a graduate of Purdue University in Agricultural Engineering, entered the business in 1999 after working for 3 years at two agricultural-related companies. His job is to make sure everyone has the tools to be successful from internal systems, to advertising, to training, to developing the direction of the business. Kevin (left) and Walt (right) in the summer of 1989(?). Left to Right: Walt KELLEY (F0under), Ethan Zarse, Jeff Altman, Eric Post (Precision Ag Lead), Harry "Bones" Javens (Service and Sales Lead), Miles McMindes, and Kevin Kelley. Harry Javens, our Service and Sales Lead for our traditional systems, has been with us for over 35 years. Harry is an integral part of our operation; he manages most of the day-to-day office operations including spray and NH3 system builds, pump repairs, billing, and most parts ordering. Eric Post, our Precision Ag Service and Sales Lead, has been in the field servicing and installing precision ag equipment for over 5 years. If you have questions, he is the man to call. He is available for on-site installs and service at any time. Eric's hands-on knowledge of using this equipment on our farm gives him an additional insight that benefits our customers. Miles McMindes joined the team in the spring of 2016. Miles has been farming since he was born. He has the "in the dirt" experience from his farm and on our farm to make sure your installation and operation are successful. He is trained in Ag Leader and is continually expanding his knowledge in everything that we offer. He is available to assist Eric with installs & troubleshooting as needed. Jeff Altman has been with us since 2011. He has extensive experience in the seed industry and the equipment industry; plus, farming is in his blood. He is a Certified Crop Advisor (CCA) and can provide our customers with an objective and unbiased opinion when needed. He helps with sales and installs, but he also has the practical knowledge of using what we sell on our own farm. Ethan Zarse is our jack of all trades. He handles most pump repairs, NH3 system builds, Chem-Farm bracket assemblies, shipping prep, flow meter rebuilds, and whatever else comes through the door - except wires. Ethan is old school - ya gotta have those guys too.